With my school district's emphasis on workshop approaches in reading and writing, more and more of my colleagues began scrutinizing the way they teach math. I was no different. I watched classroom organizational wizards design visual rotation schedules for students to follow. They developed a center-like approach where students were divided in to 3 or 4 groups (ability, based on unit pretest data), and they taught the daily math lesson to each of the groups...think guided reading groups for the math classroom. Because I have always been somewhat organizationally challenged, I paid close attention to the structures my colleagues were developing. I learned early on in my career to "borrow" organizational structures from my colleagues. I contribute to our teams in my own way, but organization is not my forte. After watching and listening, I tried implementing similar routines in my math class. I created a gorgeous rotation schedule. I created and collected center materials. I analyzed my pretest data and formed math groups. As a former literacy coach, this didn't feel foreign to me, and I thought to myself, "I got this!" I fell flat on my face and learned something about myself and my pedagogy. My gorgeous rotation schedule was a problem. It was too rigid, and unlike guided reading, my student's math gaps with unit content closed more quickly than instructional reading levels improved in guided reading groups. So, I would move my students in and out of groups over the course of a week. This disrupted any rotation schedule I was trying to maintain. I also wasn't comfortable giving up my whole group math lesson. My math instruction felt disjointed, and this created the challenge of keeping track of instruction of the same lesson for 4 math groups, and God forbid one group didn't get their lesson for the day due to interruptions. Did I mention that I'm organizationally challenged? After struggling for three weeks, I had an epiphany. I was tuning into a Jennifer Serravallo Heinemann webinar about small group instruction in readers and writers workshop, specifically STRATEGY GROUPS. Cue the "Hallelujah Chorus" music. As I watch Serravallo teach three young students a new reading strategy in a brief small group lesson, I thought about the rigidity of the workshop structure I was trying to implement. It wasn't working for me or my students because the pretty rotation schedule was the focus---not my students! I returned the following week with new zeal and a belief that this could work. 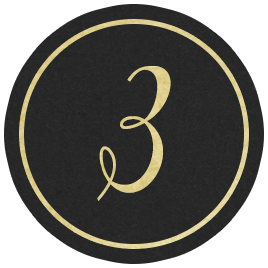 Over time, I was able to identify 3 important components necessary for the success of my math workshop. Strategy Groups Are THE Answer! I used our unit pretest as a way to inform my groupings during the first week of a unit. Think of it as peripheral vision. Students met with me in small groups based on concepts where their tests showed weaknesses. These flexible groups also were based on my students communicating their needs during whole group instruction. As a unit picked up steam (beginning of second week, usually), my strategy groups were formed based on students' performance on independent work or homework. These were formative assessments...they drove our strategy groups because by week 2 of a unit, the pretest is OLD DATA. 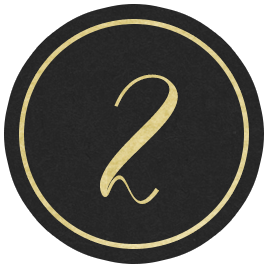 The Pretty Rotation Schedule: It's All About Purpose! 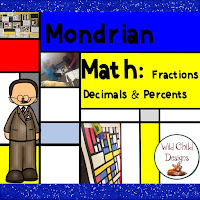 Mondays: We focused on skill building like basic facts or advanced multiplication and long division, depending on where we are in the school year and the grade level I'm teaching (4th or 5th). This means I work with small groups at this time. The groups are determined by students' levels of mastery. They are based on weekly skill assessments I developed. Students that I am not meeting with are engaged with online math learning like www.mobymax or odyssey learning. Tuesday: Whole group lesson and independent work (+/- enrichment). I teach a whole group lesson to my class using a workshop structure. This means I introduce the teaching point, we ask questions, we explore together, I model, students practice with support (on the carpet right in front of me or with a peer), and then they practice independently. During independent practice, I move around the classroom interacting with students, like I do when I hold writing conferences in writer's workshop with individual students. Then, I go to the back of the room (another teaching area in my classroom), and my students know they can join me there if more support is needed. Students needing more enrichment have more advanced problem solving opportunities embedded into their independent work. Sometimes this is created by me, and other times it is provided by our math series. 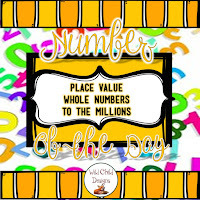 Wednesday: Number of the Day learning opportunities. This is a small group instruction day. That means that I use my students' class work from Tuesday to form strategy groups. 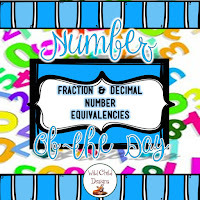 As we work together to gain understanding, other students are engaged in reteaching or enrichment number of the day opportunities. They draw a number and complete problem-solving tasks around the number. I created these around skills that demand more repetition for student mastery. Many of them are centered on fraction and decimal concepts which are challenging in 4th and 5th grade. At the end of this session, we come together as a whole group and examine our thinking with "At first I thought...now I think..." visible thinking routine. This helps us cement our learning. During this time, I also do some pre-teaching about the whole group lesson coming up tomorrow. Thursday: This day is a repeat of Tuesday's structure. Friday: On Fridays, we assess our leveled skills we've been working on all week via homework. These are the skills that were taught or reviewed on Monday. In addition, we engage in project-based learning in which math is heavily integrate for much of the day, or we begin another whole group math lesson from our unit. I work very hard to incorporate reflection opportunities into my math teaching every day. I rely heavily on visible thinking routines developed by Project Zero and Dr. Ron Ritchart. Using routines like Claim-Support-Question, See-Think-Wonder, and Tug of War elevated our discussions. We often choose one problem from our lessons to delve into more deeply. Our math workshop has become thinking-based. My students are engaged because they have a voice in their learning. Implementing a workshop approach in any subject area is a journey. I knew this from my work with literacy. I 💓workshop pedagogy. I'm still not satisfied, but I've come a long way. And isn't that the point? As teachers, we're always learning, developing, and changing because we're learners. 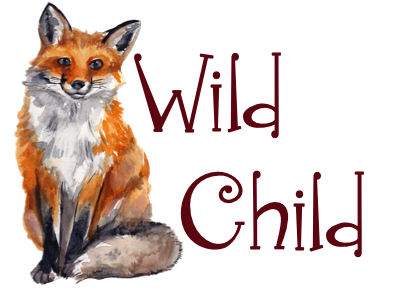 Some of the resources I mentioned in this post can be found below. Some are specific to 4th and 5th grades. Others are more general. Each of these can be used as remediation or enrichment. I use them for an entire month at a time because practice makes permanent. 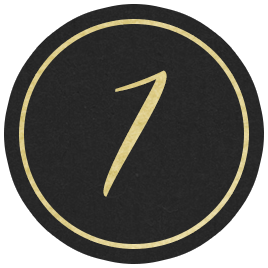 Display numbers, an assessment and answer key, and a daily workout are included in each one. OR you can buy the whole bundle at a discounted price and get 7 months of number of the day activities. 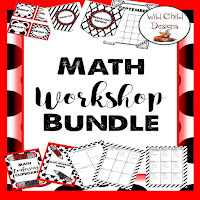 This bundle consists of calendar and small group instruction planning pages, as well as a rotation schedule bulletin board. Once you purchase it, you will enjoy a yearly update for free! These are project-based math and art projects. All have a literacy component and require critical thinking and higher-level problem solving tasks. All include an math-art project. These two leveled skill challenges are motivating for students. 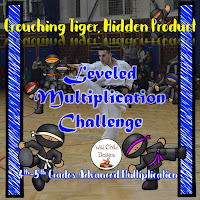 The advanced multiplication challenge takes students through 6 levels of advanced multiplication from 4 digit times 1 digit to decimal number times decimal number. 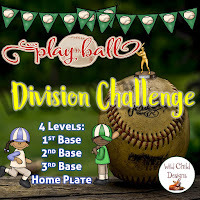 The division challenge has four levels, and students move around the bases on a baseball diamond. 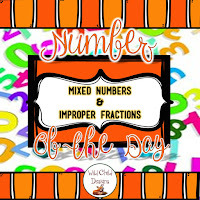 First base begins with 3 or 4 digit numbers divided by a one digit number. 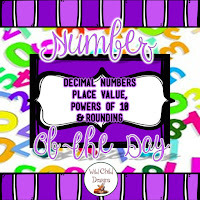 Home plate (the last level) requires students to divide decimal numbers by whole numbers. Both product include data notebook sheets for student use. Should you choose to purchase any of these resources, be sure to leave feedback and email me, letting me know what you purchased and your user name for verification purposes. 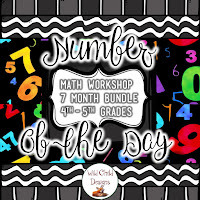 I will send you a free number calendar/number of the day organizational mini-bundle for your use! Not only will you earn TpT purchasing credits for leaving feedback, but also a free product. Until next time, teach on, friend!